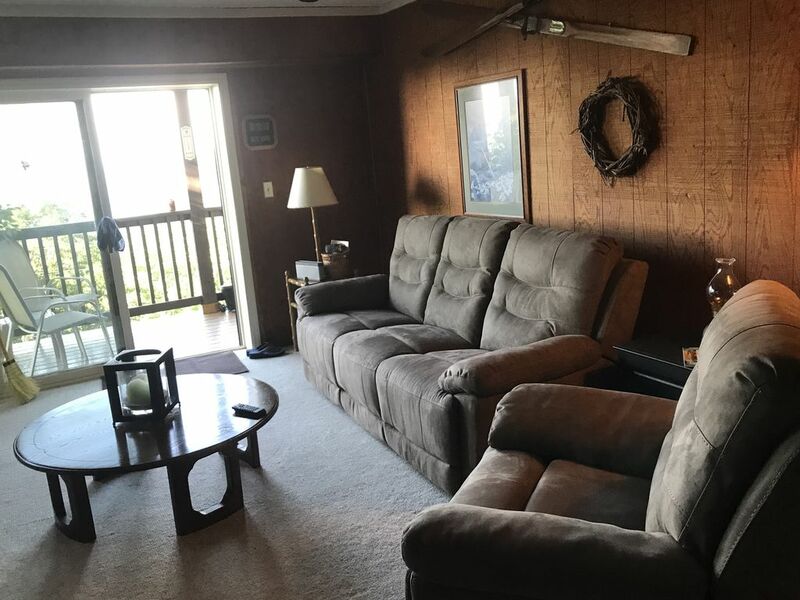 This beautiful, Non-Smoking condo is located in Beech Mountain, the highest town in the Eastern United States. The condo features a rock fireplace (gas) and spectacular views of the distant mountain ranges and golf course. The condo has a club membership with access to golf, tennis, and the swimming pool. Enjoy snowskiing just less than a mile from the condo for those winter sport activists. During the spring, summer, and fall, enjoy the wide variety of area attractions. Winter travelers should be in check with the local weather, conditions can change quickly, four wheel drive or chains may be necessary due to snow activity. The unit has a gas stone fireplace and a deck with spectacular views. The kitchen is fully-equipped. A stereo system, TV with VCR and DVD and a small video library are all included in the unit for your enjoyment. Each of the three bedrooms has its own private tiled bathroom, two kings main floor, two twins downstairs. A gas grill is at the unit for those outdoor cookouts. All linens are provided. Catering, pet-sitting, and baby-sitting can also be arranged. *LONG TERM RENTAL RATES AVAILABLE AT DISCOUNTED PRICES., Please place an inquiry for quote. Keith and Becky Johnson, along with Vin and Tina Smith fell in love with the beech Mountain area for it's skiing and fantastic mountain atmosphere, and bought this condo to spend time now and in our retirement plans. We live in Florida and the wonderfully cool summers and winter sports give us a great diversion from the Florida climate. Beatiful mountain views, hiking trails and water sports in the summer. Quiet evenings on the deck while enjoying the cool summer evenings. Being less than one mile to SKI BEECH, and five miles to Sugar Mountain provide ample variety for the winter sports.